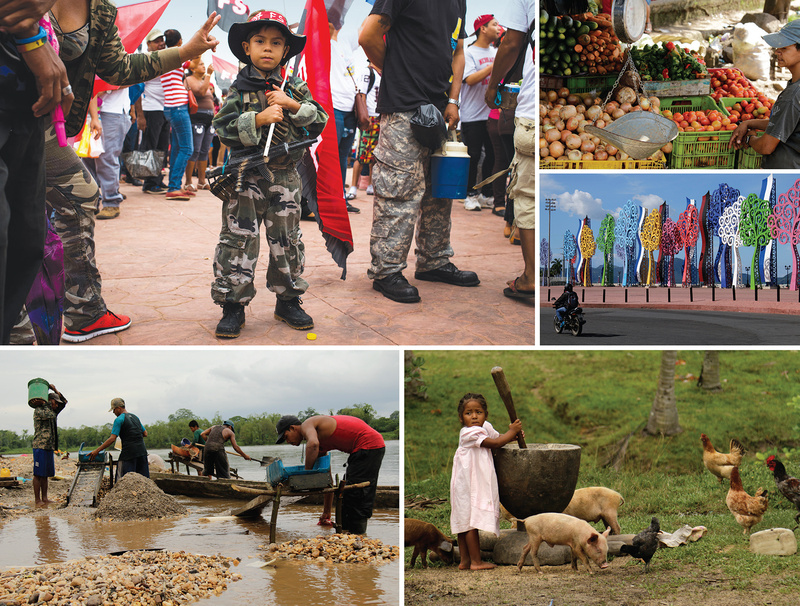 Clockwise from top left: FSLN supporters celebrate the 37th anniversary of the Sandinista revolution on 19 July 2016; fruits and vegetables grow well in Nicaragua’s tropical climate; despite harsh criticism, Rosario Murillo’s ‘trees of life’ (see main story) have multiplied over the past three years; separating rice grains from chaff is often children’s job in indigenous communities; Miskito people use artisanal methods to extract gold from rivers and mountains on the Caribbean coast. Photos: top left, Alex McDougall; all others Mira Galanova. The retired colonel is one of a number of former guerrillas who believe that the President has betrayed the ideals of the Sandinista revolution and runs the country in a not dissimilar way to Anastasio Somoza, the dictator they toppled in 1979. Ortega headed the revolutionary government in the 1980s and returned to power in 2007 after three rightwing governments. His Sandinista National Liberation Front (FSLN) party has gradually gained control over congress, the police, the military and the courts. In 2009 the Supreme Court amended the constitution to allow Ortega to stand for re-election. He has since won two landslide victories, both amid reports of irregularities. The President barred independent observers from monitoring the 2016 election and ran virtually without competition after a court ruling ousted the main opposition leader. The election was called ‘a farce’ by the opposition, saying it was marked by a high abstention rate – a claim that the government disputes. The critics accuse Ortega of seeking to install ‘dynastic’ rule in Nicaragua. His family members reportedly control fuel companies, television stations and public works. Ortega’s wife, Rosario Murillo, was his running mate in the 2016 election and is now set to become vice-president. Despite his authoritarian tendencies, Ortega enjoys genuine support among the poor as well as the business elite. Thanks to prudent macroeconomic policies, Nicaragua, the second-poorest country in Latin America after Haiti, has maintained growth levels above the region’s average. It has been spared the high rates of crime and gang violence that plague its northern neighbours. The poverty level has fallen from 42.5 per cent in 2009 to 29.6 per cent in 2014, according to the World Bank. During the revolutionary period there was huge improvement in the spheres of health and education. Ortega has expanded access to public housing and services and introduced popular social programmes such as free roofing and farm animals for poor families. But the progress has not reached everyone. In rural areas and in the autonomous regions of the Caribbean coast, access to basic services is a daily challenge – dirt roads are riddled with potholes, there is no running water and electricity is either nonexistent or suffers frequent power cuts. State money is not always wisely spent. Murillo reportedly paid $3.3 million for 134 ‘trees of life’ – multicoloured metallic structures that line the main roads of the capital Managua and light up in the night. Nicaragua’s national budget may soon come under strain – and particularly its social-welfare programmes, which have been backed by the country’s leftist allies. Venezuela is overwhelmed by an economic crisis and Cuba is normalizing relations with the United States. Meanwhile, the US House of Representatives has unanimously passed legislation known as the Nica Act. This is meant to stop Ortega from accessing international loans until he adopts reforms that promote democracy, the rule of law and human rights, and conducts free and fair elections. There is a long tradition of US intervention in Nicaragua. The five-year-long trade embargo imposed in the 1980s by Ronald Reagan strangled the Nicaraguan economy. At the same time, Washington sponsored counterrevolutionary groups known as Contras in a civil war that killed 30,000 people. There is a talk of a new war on the streets of Nicaragua. People say the country is at a crossroads and it can go either way. President José Daniel Ortega Saavedra. 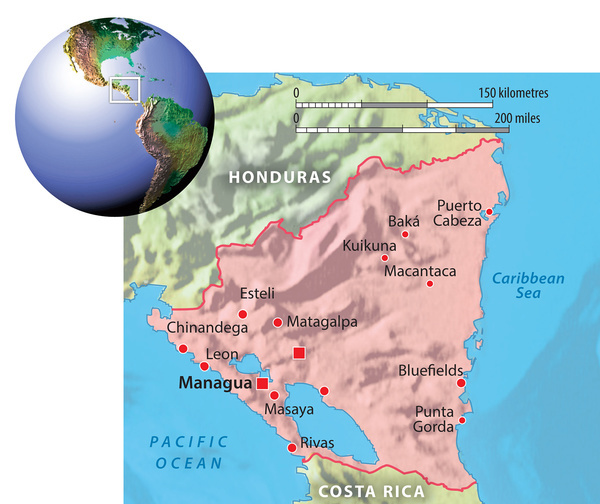 GNI per capita $1,940 (Honduras $2,270, United States $54,960). The country has steadily expanded both exports and foreign direct investment, helping it to weather the global economic crisis of 2008 and rising food and oil prices. While overall poverty has decreased, it is more than twice as great in rural than in urban areas and affects children and women most severely. beef, coffee, seafood, sugar, industrial goods, gold, bananas. 6.1 million. Population growth rate 1990-2015: 1.5%. People per square kilometre 51 (UK 269). Infant mortality 19 per 1,000 live births (Honduras 17, US 6). Social inequalities limit access to healthcare and chronic malnutrition remains high among people with the lowest income. Large-scale commercial and slash-and-burn agriculture has decimated Nicaragua’s forests and left the land vulnerable to landslides and droughts. The Bosawas and Sureste de Nicaragua biosphere reserves, which are among Central America’s largest, lost 3,000 square kilometres of forest between 2011 and 2016. The government’s plan to cut a 300-kilometre-long canal across the country that would connect the Pacific to the Caribbean has set off alarm bells among environmentalists who warn that the project threatens vital wildlife and wetlands. Mestizo (mixed Amerindian and white) 69%, white 17%, black 9%, Amerindian (Miskitos, Sunos and Ramas) 5%. Roman Catholic 58.5%, Protestant 23.2% (Evangelical 21.6%, Moravian 1.6%), Jehovah’s Witnesses 0.9%, other 1.6%, none 15.7%. Spanish (official) 95.3%, Miskito 2.2%, Mestizo of the Caribbean coast 2%, other 0.5%. 0.631 (Honduras 0.606, US 0.915). While the overall poverty rate has declined, income inequality has risen from 45.16 in 1998 to 47.05 in 2014, according to the World Bank’s GINI index. Violence against women remains widespread and under-reported. Abortion is now illegal even if the mother’s life is at risk – a product of Ortega’s high-profile adoption of traditional Catholic ‘family values’. There have been scores of deaths stemming from the ban. A crackdown on free speech, opposition parties, activists and foreign diplomats has been condemned as a bid to bolster one-party rule. There are increasing reports of self-censorship in private discussion. 82%. Primary and secondary school enrolment has steadily increased since the 1970s, but there is a significant dropout among children from poor families. Teachers are badly paid. Nicaragua decriminalized samesex relationships in 2008. Laws ban discrimination in employment and healthcare based on sexual identity, but the 2014 family code limits marriage, partnerships and adoption to heterosexual couples. Ortega’s social programmes favour his party’s supporters. Opponents struggle to get access to basic services or to be protected against violations of their rights. Nicaragua has a number of laws that are internationally praised but not actually implemented. The country ranks 130th of 168 in Transparency International’s corruption index. Corruption charges against highranking government officials are rare, while accusations of corruption against opposition figures are often criticized for being politically motivated. Scratchy Lines - Making a difference?